Contact us to request access or a custom dashboard of your own. 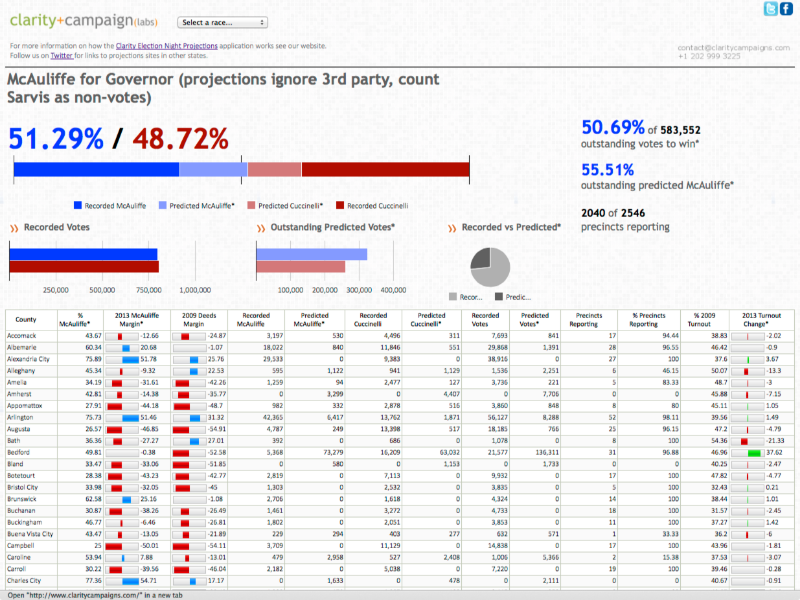 As a research and development exercise for real-time modeling applications, we first built an online dashboard in 2012 for the Tim Kaine for Senate campaign that correctly predicted final statewide results based on partial actual election results. Initially a research and development exercise for real-time modeling applications, we built our first online dashboard for Senator Tim Kaine in 2012. Here is a snapshot from the Kaine for Senate boiler room on Election Day that year. Our election projections are updated using live county or township election returns from the Associated Press, or precinct-level results in states where publicly available. It takes the actual results as they are reported, and uses a constantly self-adjusting model to project the final result statewide based on the results reported thus far (taking into account geographic differences, turnout, performance, our latest Democratic Party Score, and a Candidate Support Score). Clarity’s real-time modeling is then enabled with TargetSmart data, the country’s leading national voter file. We ran the dashboard for all three statewide races in Virginia in 2013. It called a narrow but historic Democratic sweep early in the evening, even for the Attorney General race which ultimately ended in a recount. In 2014, we dramatically expanded our projection dashboard map to include 13 Senate races tracked publicly and a number of private client dashboards for Governor's races. While most races were unfortunately decided quickly, the dashboard correctly predicted tight races in Virginia and Connecticut. We significantly refined our processes for gubernatorial races in 2015. For example, in Kentucky the Dashboard accurately, but depressingly, predicted the final results within 20 minutes of polls closing and only a handful of precincts reporting in spite of conventional wisdom showing a Democratic win. In 2016 we tracked the Presidential race in Virginia and North Carolina publicly. For friends and family of the Democratic Party we had a private dashboard tracking the Presidential, Senate, and many other races in every state.